Give little baby a spiraling good time to learn and have fun at the same time. Little Burberri Himme - Multicolor Hanging Bebe Mobile is designed to easily latch to baby cot or crib. It allows little fingers to explore chubby adorable Baby Softies. 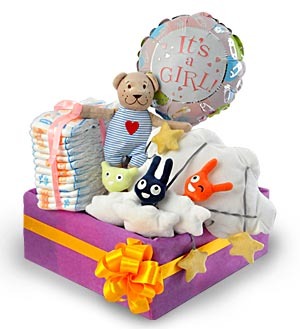 Learning Himme is accompanied by Huggies Newborn Baby Diapers 12pc, Fabby Soft Heart Bear and a 9" "It's A Boy" or "It's a Girl" Balloon. Adorable collection is packed in a designer box dressed with ribbons. Immediate same-day delivery applies for delivery within Klang Valley. At least 3 days notice is required for outstation deliveries. Call Giftlab at 03-78830233 / +6012-6915200 or email us at sales@gift-lab.com for assistance.